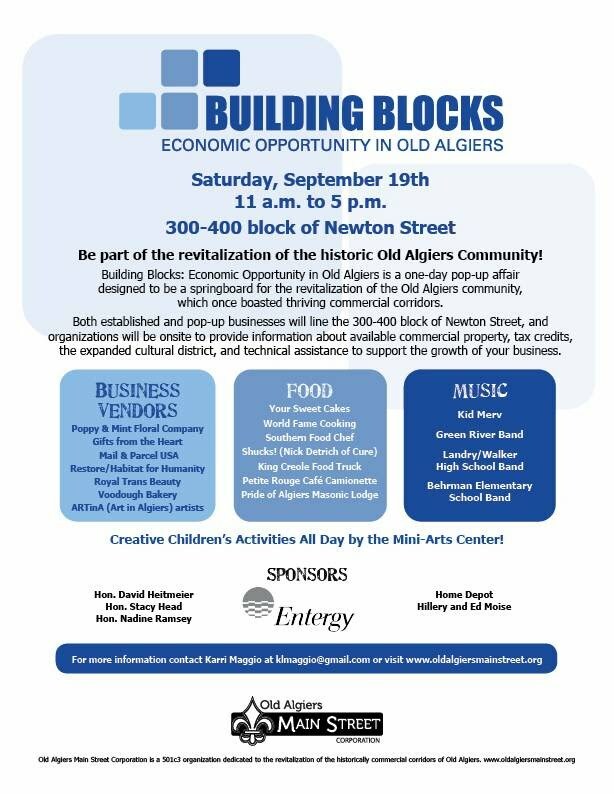 "Building Blocks: Opportunity in Old Algiers" is the culmination of several months of Old Algiers Main Street Corporation's re-imagining several blocks of Newton Street as a springboard to the revitalization of the community.The event is scheduled for Saturday, September 19, from 11 a.m. to 5 p.m. in the 300-400 blocks of Newton Street. Planning for this event is in its final stages, but volunteers and funds are still needed. If you would like to be part of this event, contact project chair, Karri Maggio at klmaggio@gmail.com. For updated information in the coming weeks, visit www.oldalgiersmainstreet.org or follow on Facebook @ Old Algiers Main Street.